Before switching on the power, make sure that the preset R13 is set for maximum resistance and no speakers are connected to the output of the amplifier. The Vbe multiplier Q6, must also be thermally coupled to the main heatsink to prevent thermal runaway. With the input shorted to ground, slowly increase the output of the power transformer to the working voltage of 40-0-40Vac with a variac. 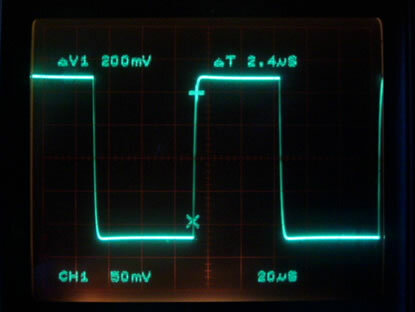 This should be done with an oscilloscope connected to the output of the amplifier. If the amplifier is properly assembled, there should be no oscillations at the output as you gradually power up the amplifier's transformer. With the supply rail voltages at +-53.5V, the DC operating points should read TP1=1.65V; TP2=1.0V; TP3=0.84V; TP4=0.26V and TP5=0.79V. Once this is established, slowly increase the bias of the output into Class AB to 100mA per output transistor. A DMM across an emitter resistor (0.39 ohms) should read 39mV. 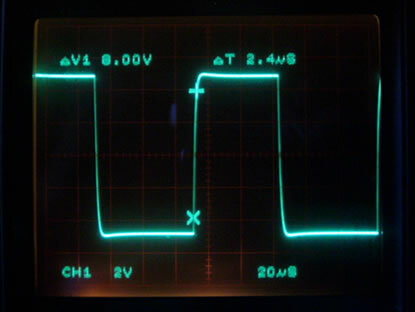 With the oscilloscope set to 5mV resolution, you should be able to reproduce Fig 1. Switch off the amplifier and connect a 10 watts 8 ohms dummy load to the output. Remove the input short and connect the signal generator to the amplifier. 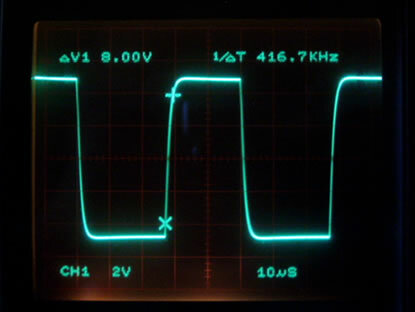 Set the oscilloscope to 50mV resolution and slowly power up the amplifier again. 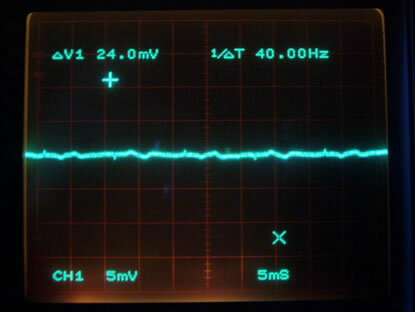 Inject a 10KHz square wave for a peak to peak reading of 250mV. You should be able to reproduce Fig 2. There should be no signs of ringing on the square wave. Rise time should read 2.4us from 10%-90% of 250mVp-p.
Increase the input signal to reflect 10Vp-p as seen in Fig 3. Rise time and square wave should remain unchanged. Reset the signal generator for 20KHz square wave output. Repeat the above procedure for an output of 10Vp-p and you should be able to replicate Fig 4. Note the absence of overshoot and ringing and fairly wide bandwidth.